Dr. James McLaughlin was born in 1835 on a farm near Fingal (Elgin County) Ontario. His parents were Thomas McLaughlin and the former Lydia Pettit. Dr. McLaughlin was the 7th of 10 children. His siblings were; John, Thomas Jr., Nancy, William, Michael, Lawrence, Miar, Daniel and Mary. Dr. James McLaughlin received his medical degree from Victoria College in Toronto in 1862. In the calendar of the University of Victoria College published in 1868, tuition to the college was listed at $10.00. Courses in the Faculty of Medicine were listed at: 2 winter sessions were $186.00, 1 session was $100.00 and a summer session was $35.00. After graduation, Dr. James McLaughlin and his younger brother Dr. Miar McLaughlin opened a medical practice in Ridgetown at an office located at 56 Main Street East. Dr. Miar McLaughlin left to train at Bellevue Hospital Medical College in 1864. 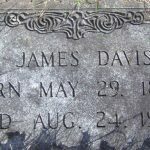 Dr. James McLaughlin was listed in the 1865 Kent County Gazetteer and Directory. In this publication Dr. McLaughlin is listed under the sub-title of Duart. It is unknown if Dr. James McLaughlin moved to Duart or just travelled to a Duart office to see patients. Dr McLaughlin served his patients in Kent County for about 15 years. 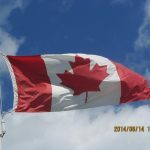 According to the 1881 census, Dr. James McLaughlin, his wife Mary and their two children, Anna “Laura” who was 11 and Herbert who was 6 years old, were residing in Southwold Twp in Elgin County. According to the 1886 Elgin, Essex, Kent and Lambton Farmers and Business Directory, Dr. McLaughlin’s practice was located in Fingal. 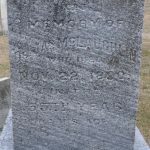 Mary McLaughlin died in Southwold Twp (Elgin County) on the 17th of January, 1888. This is confirmed by her death record, but the tombstone in the Fingal Cemetery, records her death as January 17, 1887. The death record also lists Mrs. McLaughlin as having been born in Dearborn, Michigan and she was 41 years old at the time of her death. 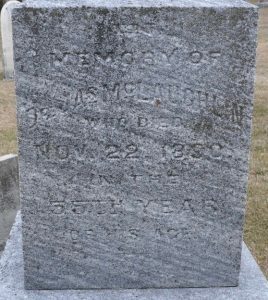 Dr. McLaughlin died on the 22nd of November 1890 in Southwold Twp. 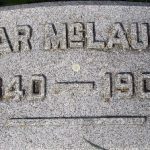 *His son Herbert James McLaughlin drowned near Aylmer (Elgin County) on the 12th of June, 1892 at the age of 17. The local Aylmer newspaper published an article detailing the drowning in the 16th of June, 1892 edition. He was buried alongside his parents in Fingal. **Anna “Lora” Mclaughlin married George Bingham on the 16th of September, 1891 in Aylmer. At the time of her marriage she was residing in Dresden. 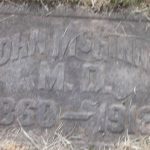 Mr. Bingham was a merchant in Aylmer. George and Lora Bingham had one child who was born on the 27th of July, 1892, just 45 days after the drowning death of her brother. They named him Herbert after her deceased brother. ***Dr. McLaughlin’s grandson, Herbert became a doctor of optometry. Dr Herbert Roydon Bingham served with the United States Army during WWII. At the time of his enlistment he resided in Detroit, with his wife Flossie. Dr. Bingham retired to Aylmer and he died in 1964. He was buried at the Aylmer Cemetery near his parents. ****His brother’s Lawrence and Miar also became physicians. Dr. Lawrence McLaughlin practiced medicine in Elgin County and is not known to have practiced in Kent County. Dr. Lawrence McLaughlin died on the 10th of November, 1863 at the age of 31. Dr. Lawrence McLaughlin is buried at the Fingal Cemetery. Dr. Miar McLaughlin is also featured on the Chatham-Kent Physician Tribute website.